Wax earplugs, invented in 1907, and virtually unchanged to this day, and moldable silicone earplugs have a huge following, and for good reasons. I am a huge fan of foam but I have also come to appreciate moldable earplugs. Foam earplugs are not for everyone. Some people simply can’t tolerate even the softest foam in their ear for long. Ear pressure, itching, and outright ear pain keep them from falling asleep so they grudgingly accept the noise. To exert their magic, foam earplugs need to be inserted quite deep into the ear canal (as shown in the image below). This makes them comfortable even for most people who cannot tolerate anything, including foam earplugs, in their ear. But even if you are a regular user of foam earplugs without any major issues, you might still want to give your ears a break from time to time without foregoing noise blocking at night or while studying or working. 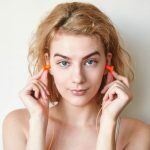 In this post, I am going to introduce my favorite moldable wax and silicone earplugs and describe some of the most notable differences compared to foam earplugs. How effective are wax and silicone earplugs at reducing noise compared to foam? How to improve on the effectiveness of wax and silicone earplugs? At body temperature, wax and silicone putty earplugs are malleable and can be made to perfectly seal the ear canal entrance. 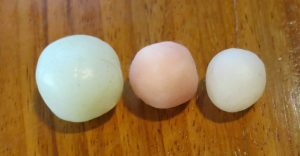 To apply them, mold them with your hands to warm them up, form them into a ball, and then gently press them against your ear opening—flattening the ball. To release trapped air from the ear, pull your ear up while keeping your thumb on the flattened earplug. I generally repeat this last step once or twice, perhaps twenty minutes after the initial application for better seal and comfort. The moldable earplugs I recommend are Ohropax Classic (wax-cotton mix), Quies Pure Wax (wax), and Mack’s Pillow Soft Silicone Putty (silicone rubber). All three are supremely comfortable and reliably seal the ear entrance. Ohropax Classic provide the most durable seal, but their wax formula is also the stickiest. On the other hand, Mack’s and Quies’ earplugs are less sticky, but at times can become loose if you move your jaw a lot. Pressing them against the ear again while slightly pulling up the ear solves this problem. Mack’s Pillow Soft are by far the largest ones, followed by Ohropax Classic and Quies Pure Wax. All three a large enough to seal my ear; In my opinion, Ohropax’ size is ideal. Mack’s almost use too much material with the consequence that it can get in contact with the pillow. This is really only a small problem, but some lint can get stuck to the silicone, shortening the life span of the earplugs. One would be tempted to cut them in half, but the company advises to use the whole plug and not break them apart, so that’s what I advise you do. The silicone and wax earplugs I have tried are virtually identical in their ability to reduce noise. Nevertheless, they are a very good alternative for sleep and moderate noise environments. Both Mack’s (NRR 22) and Ohropax (NRR 23) have been certified for use as a hearing protector in the U.S., as is indicated by their EPA label stating the NRR. Ohropax Classic have also been tested according to the European Standard—and have an SNR (single number rating) of 27 dB. Quies Pure Wax have only been tested according to the European Standard and also have an SNR (single number rating) of 27 dB, the same as Ohropax Classic. Quies are great for use at night and to reduce every-day and office noise. However, without an EPA label stating the NRR I would not use them in the U.S. when hearing protection is mandated. Note: Due to a different testing and calculation method, the SNR is always a few decibels higher than the NRR, so you can’t compare them directly. In the following table, I have listed the noise reduction numbers for some of my favorite wax, silicone, and foam earplugs. As you can see, in particular at frequencies below 2000 Hz, foam earplugs reduce noise a lot better. This is important if you want to block traffic rumble, loud snoring noise, generator or train engine noise, and other noises with significant amounts of low-frequency noise. Foam earplugs are also better at blocking speech noise (500 – 4000 Hz). Currently, I often use Flents Quiet Please cylindrical foam earplugs for sleep. I find them very comfortable, effective, and easy to insert. On the other hand, for foam earplugs to achieve their superior noise reduction you need to insert them quite deep into your ear canal. With shallow insertion, foam earplugs’ low frequency attenuation is not going to be a lot better, and perhaps even worse than wax earplugs’. So If you find deeply inserted foam earplugs uncomfortable, wax and soft silicone earplugs are indeed a good alternative. As a hearing protector, you are limited to an NRR of 22-23 dB when using wax or silicone putty earplugs. But if you are using them during sleep, you can add white noise to substantially improve on the noise blocking effectiveness of this type of earplug and keep bothering noises at bay. For me, earplugs and a white noise machine on my night stand work together like a charm. The problem with many types of earplugs is that they don’t block noise evenly across all frequencies. Before applying your earplugs, your environment might have been loud. After fitting your earplugs, everything will have become much quieter, but now certain frequencies stand out and bother you. Besides, your sense of hearing might also have become more sensitive. Choosing a white noise pitch that masks the sound frequencies where the earplugs are weaker allows you to compensate for that weakness. Likewise, if office or dormitory noise and chatter are keeping you from concentrating on your work/studying, apply your earplugs to lower the general noise level reaching your ears. Then play white noise at a moderate volume through bone conduction headphones to mask the people talking around you. When the ear opening is sealed (occluded), body generated sounds that enter the ear through the ear canal wall cannot escape as they usually would (through the open ear) and get amplified. This includes sounds you make when chewing food, walking, or talking. You’ll easily notice this occlusion effect when your voice suddenly sounds boomy or you experience a large impact sound while walking. For example, try pronouncing “raw” or “are,” emphasizing the “r” with fitted wax earplugs. 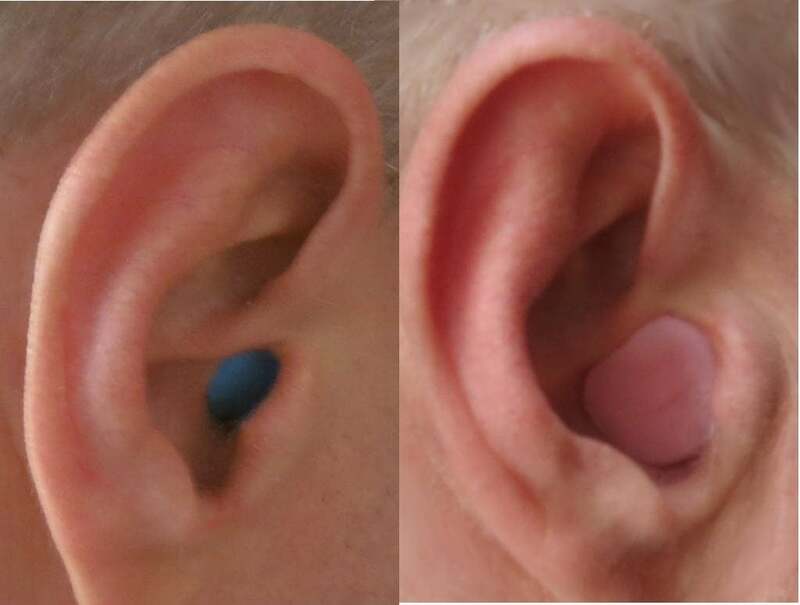 Because wax and silicone earplugs only seal the ear entrance, they exhibit a much larger occlusion effect than foam earplugs. This applies to all moldable earplugs I have tried. In contrast, deeply inserted foam earplugs can reach into the bony part of the ear canal, i.e., they fill almost the complete ear canal. With properly fitted foam earplugs, I experience virtually no occlusion effect. However, if you only insert your foam earplugs shallowly, you’ll very likely also experience a large occlusion effect. I use the absence/presence of this effect as a subjective test of whether I have inserted my foam earplugs deep enough. All in all, I like wax and other moldable earplugs for sleeping and stationary use, e.g., when studying, but I much prefer foam earplugs when walking around or eating. Foam earplugs are the gold standard if you are looking for maximum noise reduction. For low-frequency noise, in particular, they are much more effective than moldable wax and silicone putty earplugs. Once you have found a pair that fits you and gotten the hang out of how to roll foam earplugs and insert them they are also very comfortable. 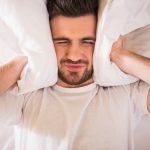 On the other hand, moldable wax and silicone earplugs do provide substantial noise reduction that is good enough for most people to fall and stay asleep and block every-day noise that may annoy or distract you. They seal the ear canal entrance well and don’t go into the ear. This makes them supremely comfortable even for most users who cannot tolerate anything in their ear. They are easy to apply and like foam earplugs can be combined with white noise for even better noise isolation during sleep and while studying or doing office-work that requires concentration. I recommend you try both foam and moldable earplugs. This way you can also give your ears a break without sacrificing noise protection or foregoing sleep.